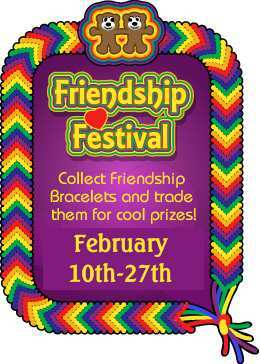 Pandanda - Henry's Blog: It's Friendship Festival Time! A circle's round, it has no end. That's how long I will be your friend! The 2nd Annual Pandanda Friendship Festival has finally begun! Rainbow-colored friendship bracelets are scattered all over Pandanda for you to find and collect. Visit Lucy at the Fishing Hole to check out her selection of cool prizes, and when you've collected enough bracelets, you can trade them to her for a prize! This is also a great time to get ahead on your Quests, because there are 2 extra Quests each day, for a total of 11 daily Quests. The extra Quests have a cool friendship theme that I think you will enjoy. Along with the heavy snow that has returned, the Friendship Festival has some of my favorite decorations of the whole year! There are so many nice places to hang out, sit, and chat with your friends old and new. And if you don't feel like chatting you can just listen to the Festival music and enjoy the scenery.